I just revised my explanation on the previous post and that text is now in brown. I realized it was not very clear and had Russell help me out with a better description. Cheers! I have just posted a youtube video of setting up and packing up the sailing rig for the PT Eleven nesting dinghy. This is something I was supposed to do before the Christmas holidays, and, well, I forgot. The foils you see are the foils that we provide as a kit and details are on ptwatercraft.com. The sail was our first design, though this video was taken before we trimmed up the foot just a little. We have a new design that has 2 short battens instead of the full one at the top. It is sleeved on and is really easy to manage. The shorter batten allows for a looser sleeve. Since we have had requests for a sail with a zipper luff for use with a halyard, we can now use the same design with a couple of hours additional labor to offer as an alternative. Having a halyard also means altering on the mast and adds complication over the sleeved luff. The total weight of this rig is only 13 LBS. Prices for sails are still unknown. To have them made locally, they would cost $750-800. We are currently awaiting a quote from an offshore sail maker. ..Bummer to have to go offshore but the buyer can choose local artisan sails or production sails based on what they would rather pay. Luckily for some, principle can still outweigh cost, and we can offer that choice if someone wishes. The mast and boom are also not yet priced. I hope we will have a price idea very soon. Being a little company as we are, it is a bit of a trick to get the carbon spars wholesale in small quantity. It has been weeks since we posted...Russell has been building a new PT Eleven in the shop while ironing out details in the manual. I have been re editing the manual and shuffling photos and chapters around, among other things. In between all this and packing kits, Russell crated up our show boat and we shipped it to the east coast where it has just been christened "Wheels" and launched aboard it's new mother ship, bound for the Caribbean and Pacific via Panama. We are very excited about the adventures yet to come for this boat. Some of our brave first customers for the PT Eleven have launched into their projects and I look forward to even more posts soon on the PT Eleven Builder's blogspot created just for this purpose. It was brought to my attention that I had not posted about the current feature in Wooden Boat Magazine's 2012 issue of "Small Boats"! 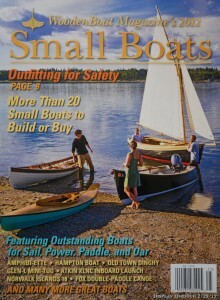 It is a great article by Tom Jackson who came out just before the Boat festival and took the boat out for a "test drive". If you have not checked it out yet, please do! It should be at your local news stand or here online: "2012 Small Boats"
On a recent cold day, we drove the PT Eleven over to Mystery Bay and sailed it up into the next bay about a mile to our boat, Jzerro. The seagulls had made a real mess on deck and we had some general maintenance to do. 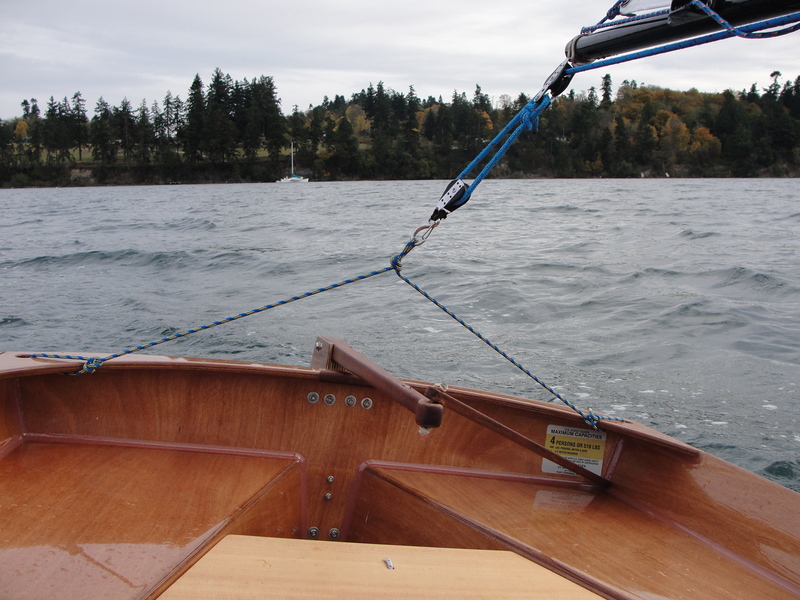 On our sail back to the launch ramp, we remembered to snap a couple of pictures of the "Self steering" on the PT Eleven nesting dinghy... 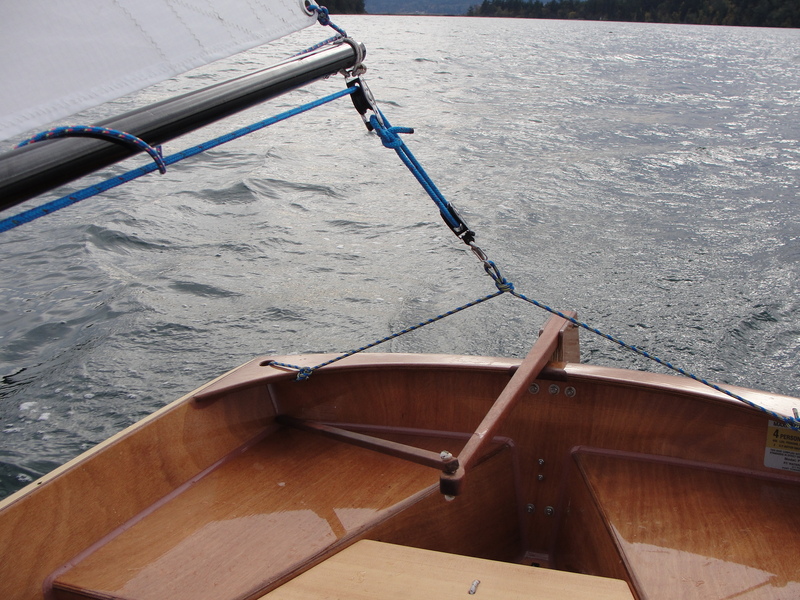 The hiking stick is cut to the right length, and tucks into the transom corner. It gave us a chance to warm our hands in our pockets until we tacked.